(Toronto, Ontario, Canada)- Toronto YC & National YC welcome the J/80 Community! The Fleet 20 J/80 class flag is up and we’re looking forward to hosting the best North American Championship yet! For the first time ever, the NA’s will be hosted in Canada at National Yacht Club, right in the heart of downtown Toronto. Mark your calendars now- August 4th to 7th, 2016! The 2016 NA’s follow one week after the LYRA regatta, just 35 minutes from Toronto. Consider entering both regattas for back-to-back weekend competition and time to enjoy Toronto (remember, the CN Spire is still the world’s tallest man-made structure). Got ANY questions whatsoever?! Contact Fleet Captain Larry Alexander (J/80 CAN 33 JIGGERS! )- cell# +1-416-464-5236. For Whitby YC’s LYRA Regatta sailing information. 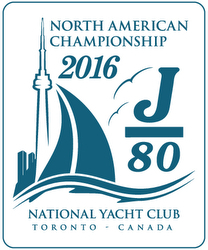 For more 2016 J/80 North Americans sailing information. Online-Meldungen wieder über www.manage2sail.com . Im Meldegeld ist wieder ein Meisterschafts-Essen am Freitag abend den 11.9. inklusive.